Over the weekend though, all eyes were on America's newest swimming hero and not just because of his shoes, his stature, or even his shiny new Olympic medal. It was from the glimmering line of diamonds covering his teeth from Lochte's custom-made red, white, and blue American flag grill. 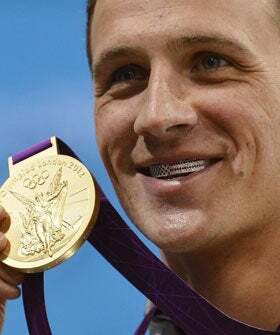 The swimmer got the encrusted mouthpiece made so he could wear it on the medal podium, but officials told him he'd give up the gold by doing so. He was able to show it off during photos afterward, but for a high-profile, history-making event, it begs the question: Should the red, white, and blue only be displayed with a set of pearly whites? Team USA's uniforms have been so hotly debated these games that we're torn on if this is a bold (not to mention expensive!) patriotic statement, or if an event centered around tradition should only be glimmering via gold medals. Help us make up our minds — is this sparkling grin too much for the games? Or it is an all-American stunner?